Thoughtful packaging choices turn ordinary soap into a beautiful handmade gift. Soap makers who plan to give their creations as gifts or start a soap making business have a number of choices in creative packaging for handmade soap. Creative packaging for handmade soap makes it obvious that your soap is a unique handcrafted creation and not something simply purchased from a store. If you use special ingredients in your soap or have a unique fragrance, the packaging can be used to convey this information. If you plan to sell your soap, the packaging can be part of your business identity. When soap is included in a gift basket featuring body lotions, bath bombs, or other coordinating products, the packaging can reinforce the theme of the gift. Handmade soap packaging doesn't have to be complicated or expensive. If you're looking for simple packaging solutions, consider using cellophane or polypropylene, gift wrap, fabric, handmade washcloths, or scrapbook supplies left over from previous paper crafting projects. Cellophane or polypropylene is an easy and inexpensive way to package handmade soap. These clear plastics are sold in sheets or bags. If you make shaped soaps or soaps with decorative embellishments within the bars, this clear packaging allows the customer to easily see your work. Gift wrap, sold at stationary or office supply stores, offers another great packaging solution for soap makers. Simply wrap individual bars in themed gift wrap and tie with a pretty ribbon. If you prefer clear packaging, an alternative packaging solution is to wrap the soap in cellophane or polypropylene sheets and use the gift wrap to make decorative tags. Fabric makes a creative choice for soap packaging and cheap fabric can by recycling clothing found at garage sales or thrift stores. For example, you can wrap strips of denim around the soap and tie with a lather cord for a western look. For a feminine packaging choice for floral scented soap, try silk fabric tied with a sheer ribbon. If you can sew, you may also want to consider making reusable fabric bags to use as creative packaging for handmade soap. Craft and Fabric Links has a gift bag pattern that could be altered to use as soap packaging. To turn your soap into a multifunctional gift, consider choosing packaging that offers an additional benefit. If you enjoy knitting or crocheting, you can make beautiful washcloths that double as simple soap packaging. Craftown has a simple knitted washcloth pattern and Crochet Pattern Central has a number of patterns for crocheted bath items. If you enjoy scrapbooking in addition to soap making, put your leftover paper crafting supplies to good use by designing unique soap packaging. Wrap the soap in pretty patterned scrapbook paper, then use stickers or other embellishments to add extra flair to the presentation. If you enjoy rubber stamping, you could also try making your own decorative paper from plain cardstock. 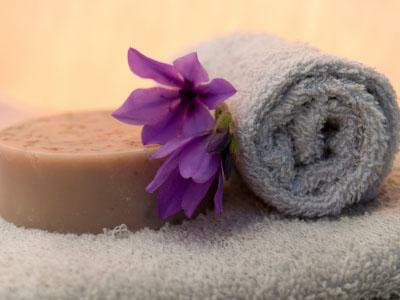 From Nature With Love offers a large selection of packaging supplies for handmade soap and other toiletries. Soap Crafters has a number of packaging supplies for soap makers, including decorative containers, soap dishes, and fabric bags. Brambleberry has soap packaging options that include cardboard boxes, metal tins, and waterproof labels. U.S. Box Corp. offers a number of clear plastic boxes for packaging handmade soap.